Aman Mathur (Shahrukh Khan) is a breath of fresh air when he moves into unhappy Naina's (Priety Zinta) tiny Indian neighborhood in Manhattan, conspiring with friend Rohit (Saif Ali Khan) to help her find happiness. This tear-jerking romantic comedy-drama is the story of their journey together: how they discover themselves, find the courage to love and to celebrate life. I had to watch it again. For one thing there are some catchy songs in it. But the main reason for watching it again is, that the first time around I had a problem with it, that they were pushing the Preity Zinta and Saif Ali Khan pairing through Shahrukh Khan. But now that I have watched some other Saif Ali Khan movies, I like the actor and his characters now. Also this pairing was fun in Salaam Namaste. I did enjoy this movie much more this time around. 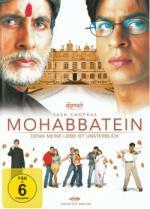 But I have a real problem with the German DVD title: "Indian Love Story". As I mentioned before, the publisher "Rapid Eye Movies" does a good job with bringing Bollywood movies to the German market. I assume they were just starting out with this when they released this. Because this title is really stupid. You could attach this title to about 90% of all Bollywood movies. And to think that this movie has not even one single scene in India but takes place entirely in Manhattan and that the relationships in this movie could just as well be centered around American characters, this title gets even more absurd. Very sloppy screenwriting. For example the youngest daughter, you is not allowed to marry the man she loves because her father doesn't like the man's family. Solution: The daughter pours gas on herself and threatens to burn herself alive. The father agrees to the marriage. Or the other daughter who doesn't believe in love goes with some friends to an island, which is off-limits to visitors because of wild animals. Just as they step off their boat, an alligator attacks and all leave again, leaving the girl behind. Hritik Roshan's character learns about this, travel himself to the island with a motorboat, finds the girl unconscious and brings her back to the boat. But when the motor doesn't start, he swims (!) back the whole way towing the boat, nearly dying doing this. This was the way for the screenwriter to motivate the girl to fall in love. Really lazy writing, in my opinion. It gets better in the second half, but it does not save this movie. The actor playing the father does a great job though. And I love the Jim Carrey parody that Hritik Roshan does in a scene. Vijay Agnihotri is a wealthy, spoilt man who lives with his mother in the city of Mumbai. His mother has allowed him everything and more than that he wants. One day on a mishap Vijay manages to reach up with an air-hostess named Shivani Chopra, he immediately falls head over heels in love with Shivani. He tells his mother about his love, and his mother agrees to get him married, on there way to Shivani's house they get a nasty shock for Shivani had get married to Ashok Chopra, an air-line pilot. Vijay is unable to accept this proposal and continues to persuade Shivani to marry him. He even destroys Shivani's family and has her sent to jail. When Shivani is released from jail she plans to take revenge from Vijay and to make him account for all his sins. A very early Shahrukh Khan movie, where he plays a character which is different then the ones he plays later on. Here is a psychopath who destroy a woman's life because she does not want to have anything to do with him. The movie starts off like the usual romantic comedy. A wealthy arrogant man falls in love with a woman, but who rejects him. He then learns that she is marrying another man. The opening credits set in here, half an hour after the movie started, as if to say, that now, the real movie starts. SRK sets things in motion, which leads to him killing the husband of the love interest, framing her in getting her into the jail. Also her sister and daughter dies, as well as her unborn child. This is the point where the movie turns into Lady Vengeance. SRK has deserved his Best Villain award. Also Madhuri Dixit did a great job. The Kapoor family want their eldest daughter, a girl named Sanjana, to get married to an American-Indian businessman named Prem. Prem is welcomed, and after a few misunderstandings, both Sanjana and Prem fall in love with each other. Then chaos descends upon the Kapoor family when they find out that the boy named Prem is a fake, and that the real Prem was delayed and is now reaching India. How will this news affect Sanjana, who has given her heart to the fake Prem? At times a very silly movie. The story is also nothing special. But there were enough fun scenes in it and also a few songs that I enjoyed, to make it a somewhat fun watch. 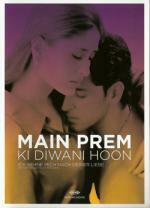 It was also the first time, that I liked a character potrayed by Kareena Kapoor throughout the movie. Hritik Roshan has again one of this hyper active character roles. Abhishek Bachchan seems to be typecast as the quiet, professionally successful, understanding, but turned down second love interest (he does it great though). A decidedly delicious mix of patriotism, comedy, science-fiction, romance and adventure. Arun (Anil Kapoor) who lives in an old spacious rented house, rescues orphans and looks after them. He is aided by his Calendar (Satish Kaushik) the cook and odd job man. When journalist Seema (Sridevi) also takes up residence in the house there is trouble. She despises children, and this brings about a love-hate relationship between Arun and Seema. One day Arun discovers something his scientist father (Ashok Kumar) had hidden, a secret formula to make one invisible. Arun uses the formula to save the country from the evil Mogambo (Amrish Puri), a villain to beat all villains. 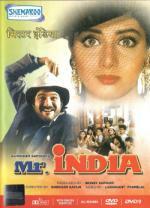 Seema falls in love with Mr. India (that is what Arun is when he is invisible), without even having seen him, not realizing that they are one and the same. Really silly superhero movie with clichéd nazi-like villains with their over-the-top leader played by Bollywood veteran Amrish Puri ("Dilwale Dulhania Le Jayenge", "Chori Chori Chupke Chupke"). If it would be half the length, this could be a cult classic outside of India. Michelle Mcnally is "special" in more ways than one. She cannot see ... nor hear nor speak...She inhabits a world of infinite black ... of a seamless, endless void where nothing reaches her and she reaches nothing. Her world is frightening in its complete remoteness. On the sheer will of her ferocious rage against destiny, Michelle struggles to stay afloat in the impenetrable whirlpool her life has become. Into this devastating isolation enters a battle weary teacher, Debraj Sahai, life's wounded but arrogantly insolent warrior. With a single minded obsession, Debraj takes up a challenge that is next to impossible - to lead this wild, uncontrollable child into the light of knowledge. Thus begins a journey of two headstrong individuals. They will overcome failures, obstacle, even ridicule as they tread the path less taken. What they seek is that moment of miracle when the ray of knowledge will penetrate through the dense black of Michelle's life...Black is the cathartic tale of a deaf, mute and blind girl who saw what people with sight fail to see, a vision of her God. Michelle Mcnally saw what other lesser mortals could not. 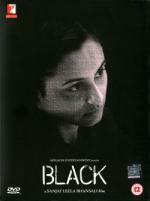 I stumbled across this movie when I went through the filmography of one of my favorite Bollywood actresses, Rani Mukherji. I became curious when I read, that this movie is about a blind, deaf and mute woman (Michelle), I wondered how this would work. If someone can pull this off, then it's Rani Mukherji. And I was not disappointed. This movie is heavily influenced by Helen Keller and the movie "The Miracle Worker", which I have never seen. Also this one is a very atypical Bollywood movie. There is no singing, no love story and this movie is "only" two hours long. It has won multiple awards and is the record-holder for the most Filmfare awards (Indian oscars) won. And I can understand why, especially the actor awards. Both Rani Mukherji, who plays the adult version of Michelle, and the girl who played the character as a child, were faboulous. It is probably the best performance Rani has given to date. Amitabh Bachchan was great as always playing Michelle's teacher. Danny Muldoon (John Candy), a Chicago policeman, still lives with his overbearing mother Rose (Maureen O`Hara). He meets and falls in love with Theresa Luna (Ally Sheedy), whose father owns the local funeral parlour. Naturally, his mother objects to the relationship, and Danny and Theresa must either overcome her objections or give up the romance. A very harmless comedy. John Candy plays a very likable guy. Ally Sheedy as the love interest is really sweet. But nothing stands out in this movie. Raj Aryan (SHAHRUKH KHAN, FilmFare Award Winner) who stands for love, he would go to any lengeths for it and Narayan Shankar (AMITABH BACHCHAN, National Award Winne, Voted The Millennium Star in the BBC Polls) who stands for discipline and fear, he believes that love leads to pain and weakness. It is also the story of 3 young men and women who have to learn to follow their hearts against many odds and it is the outcome of their love stories that will decide what will finally triumph...Love or Fear. This one has been a bit of a drag to get through. The three love stories for the young characters lag a little more depth. Too many love stories in one movie which should have focused more on a single one. And it didn't help that the young actors were not actually all that good. Also I think it would have benefited the movie, if they would have shown more flashbacks to the beginning of the relationship of Shahrukh Khan's and Aishwarya Rai's characters instead of having him constantly dance with her spirit. That approach worked well in Veer-Zara and Ghanjini, and would probably also have worked here. Also the turn of Amithabh Bachchan character from love-hating to encouraging love was too sudden. The whole movie he was shown as unwavering. But one speech close to the end of the movie later and suddenly he changes his complete mind on the matter. Regarding Only The Lonely, I liked this one a lot...partly because it featured Maureen O'Hara (one of my all-time favorite actresses from the classic era) and Ally Sheedy (one of my favorites from the contemporary era of filmmaking...at least until she started making those small independent films that never find their way to the theaters in my area. I find that poster interesting...the U.S. posters only showed the mother's legs with John Candy framed between her two legs. I remember Maureen O'Hara being on a talk show around the time this came out and the host asked her whose legs they really were and Maureen hiked her skirt up, showed her shapely legs off and said "Well they sure weren't mine!" Chalte Chalte is the tale of two hearts, Raj (Shahrukh Khan) and Piiya (Rani Mukherji). Despite their different personalities, we are taken on an emotional voyage as the pair fall deeply in love and marry. Despite the famous saying opposites attract, their marriage is put to the test as their bickering habits get the better of them. Will their love overcome all obstacles or will their harsh brush with reality end their martial bliss? Come walk along with us and be a part of their journey. A good movie. The first half is done after the popular formula: Nice poor guy falls in love with rich girl who is (almost) engaged to another man. He works hard to win her over. The second half shows something, other movies fail to show: What happens to such a pairing after they got married? How do they manage one year later? Are they still happy? Are the money problems tearing them apart because he refuses to take money from her relatives and friends? Rival news-reporters, Ajay Bakshi (Shahrukh Khan), and Ria Bannerjee (Juhi Chawla) engage in a comic war to be the first to interview notorius M.K. Sharma (Bharat Kapoor), in which Ria succeeds. Then the two are thrust in a battle for their lives as they must decide whether to save an innocent terrorist (Paresh Rawal) from being hanged, or sacrifice their very lives themselves. This movie started out really fun. Two star reporters trying to top each other. I really liked the opening scene, where SRK got into the building which has been evacuated because of a bomb thread and is interviewing the guy from the bomb squad. It also had some fun songs to watch. But about halfway through it gets too serious, and it takes itself too serious. And it gets ridiculously patriotic. It is still watchable, but nothing like the fun first part. Breckin Meyer, Jennifer Love Hewitt and Bill Murray return in another adventure with America's favourite fat cat, and this time, Garfield's giving England the royal treatment! It's a British invasion of a different king when Garfield, along with pals Jon and Odie, travels to London and meets his mirror-image in Prince, an aristocratic kitty who has inherited a fabulous castle. The two trade places, and soon Garfield is living large as only he can! There's just one problem: the dastardly Lord Dargis wants him out of the picture. 'Garfield 2' is twice the laughs and double the fun for the whole family... It's good to be the king! This was part of a cheap Garfield boxset I got. After the first Garfield movie, I had very low expectations for the second one. This movie is bearable, but only just. While the movie started out promising, it became very unfunny once they got to London. I think it would have been better, if they had included Jon and Liz more. But it seems that Breckin Meyer and Jennifer Love Hewitt only made small appearances to collect they paychecks. So we had to endure Billy Connolly as a unfunny John Cleese ripoff, who is the clichéd antagonist wanting to get rid off Garfield who poses as Prince, a look-a-like cat. Garfield is back! Follow our tubby tabby as he takes the plunge and flees his comfortable cartoon world for the 'real world'. Escaping the boredom of cartoon life, Garfield soon realises that real life felines don't enjoy nearly as much fun as cartoon cats do... as blood thirsty Chihuahuas and body building canines challenge him at every turn. But with the help of some new pals and some trusted old friends, Garfield's wacky adventures teach him where him home really is. This movie is also part of the cheap Garfield movie boxset. When the movie started, I thought "Oh, is this bad". But once you get used to the animation style, it is not that bad. It has quite a few nice ideas. I especially liked how they are producing the comic strips, and how the "real" world is separated from the "comic" world through the comic strips in the newspapers and how the character can watch the "real" world through these comic strips. I've never bothered with the films but I've always loved the Garfield strip. I have several of the collection books from years ago and they're wonderful to dip into occasionally. I like the Garfield strip...though it's gotten kind of hemogonized since so many people work on it...I don't know how much the creator actually works on it anymore. One thing I always found odd was that he had a friend come visit him in the strip once and his friend brought his dog Odie. When the friend left, Odie stayed behind and somehow became Jon's dog. How the heck did that happen?